There are plenty of handsomely ordered opportunities to indulge in a bit of park life in Paris, from the pathways of the Jardin des Tuileries to the ponds of the Jardin du Luxembourg. 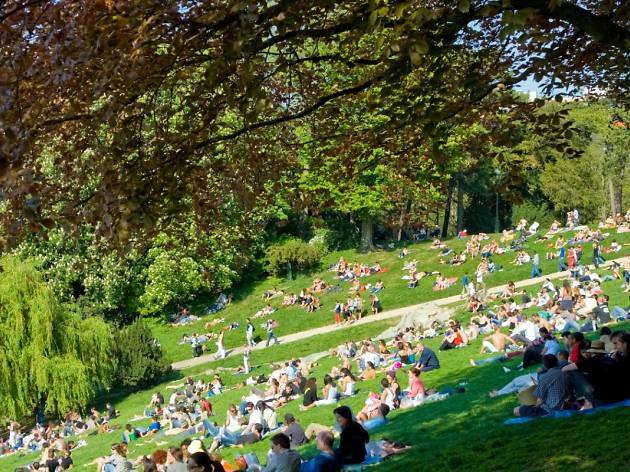 But if you're looking for something a little less formal, one patch of greenery definitely worth a stroll is the Parc des Buttes-Chaumont. Set high up in Belleville and often missed by weekenders keen not to stray too far from the tourist loop, this 19th arrondissement gem is one of the city's most magical spots. When the city's boundaries were expanded in 1860, Belleville - once a village that provided Paris with fruit, wine and weekend escapes - was absorbed and the Buttes-Chaumont was created on the site of a former gypsum and limestone quarry. The park, with its meandering paths, waterfalls, temples and vertical cliffs, was designed by Adolphe Alphand for Haussmann, and was opened as part of the celebrations for the Universal Exhibition in 1867. After lounging with the locals for a few hours, head for the park's hugely hip hangout, the wonderfully jolly Rosa Bonheur or Pavillon Puebla. Open till midnight, it makes the perfect place to sip an apéro and take in the stunning views of the city below. April 30 2017 to 31 August 2017, Mon-Sun, 7am-10pm; September 1-30, Mon-Sun, 7am-9.30pm. There are several quirky things to see (like the railway line and the temple), and also a number of cafes and food stalls dotted around. It's a really charming park, and one of my top recommendations if you want to do something a bit different in Paris. This is my absolute favourite place in Paris! As a Paris native who moved to London partly for the great availability of green spaces, an awesome, huge and spectacular parc in northern Paris is an absolute treat everytime I go back home. I'm talking moving bridge, Star Wars looking monument at the top of a massive cliff surrounded by a lake, caves and mini river, filled with all sorts of magnificent trees, flowers, bars and restaurants and insane people playing all sorts of sports and other strange classes. It's a MUST stop if you're visiting Paris.